Jewellery action group Fair Luxury announces debut exhibition at the Goldsmiths’ Centre showcasing the UK’s most talented and future-focused designers. Jewellery industry trailblazer Fair Luxury (formerly FLUX) is proud to announce its inaugural bejewelled exhibition at the Goldsmith Centre in Clerkenwell from 18th September to 27th October, 2017. This first of-its-kind exhibition will demonstrate a new view of what it means to offer a contemporary and evolving marketplace. It will explore how fine jewellery can be made all the more exquisite when provenance, ethics and responsible business practice work in synergy with design and craftsmanship. Fair Luxury Presents aims to reach a broad audience with interest in luxury jewellery, UK craftsmanship and ethical sourcing. Building on the overwhelming success of two years of industry focused events, Fair Luxury now bring their independent and catalytic approach to responsible sourcing to a wider audience. Designed to engage jewellery lovers of all kinds, Fair Luxury Presents aims to marry beauty and luxury with environmental and ethical awareness in what is sure to be a bold declaration of the innovative and positive shifts in UK craftsmanship today. Meticulously curated by a panel of UK jewellery experts, a stellar line-up of jewellery designer-makers has been selected whose work reflects three criteria around sustainable futures: design, craftsmanship and ethical provenance. The exhibition champions established makers alongside up-and-coming names and in doing so, casts a fresh light on what terms such as ethical luxury can mean. 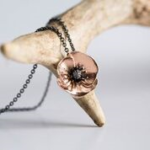 Exhibitors include GreenFinder members Mosami Jewellery and Arabel Lebrusan along with other responsible jewellers including Hannah Bedford Jewellery and Harriet Kelsall Bespoke Jewellery. For more information about the event please visit the Fairlux website.